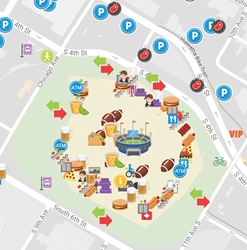 Paranoid Fan is excited to announce the launching of its new emoji map to identify places, events and people for the New England Patriots versus Philadelphia Eagles Super Bowl LII game at US Bank Stadium in Minneapolis, Minnesota. Virtual treasure chest emojis will be located all over Minneapolis to give away free prizes. Paranoid Fan is excited to announce the launching of its new emoji map for the New England Patriots versus Philadelphia Eagles Super Bowl LII game at US Bank Stadium in Minneapolis, Minnesota. For the week leading up to the Super Bowl, Paranoid Fan will deploy it’s mapping technology that is used by teams and venues to mobilize fans around venues. Paranoid Fan’s mapping technology merges emojis and live video to maps with the goal of driving seamless mobility around venues and live experiences. Last week, thousands of fans at the AFC Championship Game between the New England Patriots and Jacksonville Jaguars used the Paranoid Fan platform to navigate Gillette Stadium. Fans also used the maps to locate and watch live streams of watch parties in Boston. For the upcoming Super Bowl, fans can use our maps to find virtual treasure chest emojis that will be strategically placed around the city. Those treasure chest emojis will contain prizes. The idea of Paranoid Fan originated at the 2014 World Cup in Rio de Janeiro, Brazil. Paranoid Fan is a graduate of the Techstars Connection program in New York City and received seed funding from Techstars and ZX Ventures, the venture capital arm of AB InBev. The Paranoid Fan maps are part of a cross-platform app that can be found at ParanoidFan.com and in the Apple App and Google Play stores. Paranoid Fan, based in Dallas, Texas, is a social mapping app that helps fans navigate their game day experiences. The Paranoid Fan mapping ecosystem helps users discover what is happening around their location, while also allowing them to populate content with their own personal experiences.